LAS CRUCES, N.M. (July 1)-Following two consecutive WAC Tournament Championships and NCAA Tournament appearances, the New Mexico State men’s basketball team hits the hardwood in 2013-14 with 16 home games at the Pan American Center. The schedule features four NCAA Tournament teams from a year ago including Gonzaga, a No. 1 seed. Head coach Marvin Menzies said he was very happy with the 2013-14 slate that includes both powerhouses and mid-major standouts such as Arizona, Gonzaga, Colorado State, Drake and Aggie rivals UTEP and New Mexico. The Aggies host Western New Mexico (Oct. 29) in their only exhibition contest. NM State opens the 2013-14 season in Honolulu, Hawai’i, in a tournament against Western Michigan, Tennessee State (Nov. 8-9) and tournament host and former WAC foe, Hawai’i (Nov. 11). 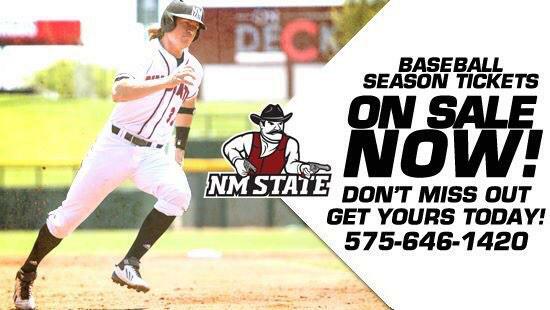 This is the fifth consecutive season NM State has started the season on the road. NM State hosts I-10 rival UTEP (Nov. 15) in the home opener that begins a stretch with four out of five games at the Pan American Center. The Aggies host Northern Colorado (Nov. 20), Bethune-Cookman (Nov. 25) and Prairie View A&M (Nov. 27). NM State travels to El Paso, Texas (Nov. 23) for the rematch with UTEP. The Aggies travel to Colorado State (Nov. 30) in Fort Collins, Colo., and then return to Las Cruces to face in-state rival New Mexico (Dec. 4) in their first meeting of the season. NM State hits the road for four consecutive away contests against Gonzaga (Dec. 7) in Spokane, Wash., Arizona (Dec. 11) in Tucson, Ariz., Drake (Dec. 14) in Des Moines, Iowa, and New Mexico (Dec. 17) in Albuquerque, N.M. The Crimson and White ends the month of December at the Pan Am versus Northern New Mexico (Dec. 21) and South Alabama (Dec. 28). The WAC welcomes six new members in 2013-14, and NM State opens conference play at Grand Canyon (Jan. 4) in Phoenix, Ariz. The Aggies host Seattle (Jan. 9) and Idaho (Jan. 11). NM State returns to the road to meet Chicago State (Jan. 16) in Chicago, Ill., and UMKC (Jan. 18) in Kansas City, Mo. A three-game home stand includes Texas-Pan American (Jan. 25), Bakersfield (Jan. 30) and Utah Valley (Feb. 1). The Aggies start the second half of WAC action at Idaho (Feb. 6) in Moscow, Idaho, and at Seattle (Feb. 8) in Seattle, Wash.
NM State hosts UMKC (Feb. 13) and Chicago State (Feb. 15) before a three-game road swing. The Aggies travel to Texas-Pan American (Feb. 20) in Edinburg, Texas, Utah Valley (Feb. 27) in Orem, Utah, and Bakersfield (March 1) in Bakersfield, Calif. The Aggies conclude the regular season at home against Grand Canyon (March 6). NM State defends its WAC titles at the conference tournament March 13-15 at the Orleans Arena in Las Vegas, Nev.